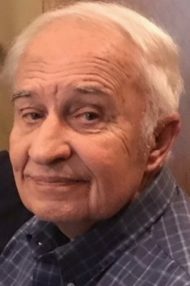 Robert L. “Bob” Sherr, 75, of Lancaster went home to be with the Lord on April 8, 2019. Born in Waco, TX he was the son of ClaraMae (Smith) Sherr and the late Lester Sherr and the beloved husband of Dianne L. (Covert) Sherr. A graduate of J.P. McCaskey High School, Class of 1961, Bob continued his education at Penn State – York and received his Associates Degree in Engineering. Following his college career, Bob proudly served his country as a member of the National Guard. Following his time in the National Guard, Bob focused on his engineering career working for Black & Decker, Hamilton Watch, Raymark, and SteelFab as a draftsman. Bob was a man of many interests and he loved sharing them with others. He studied and collected rocks, fossils, and American Flyer trains. He enjoyed ice skating, target shooting, and working on cars. Bob’s passion was music. He loved listening to the oldies, country, and Celtic music and passing on his favorites to his friends and family. Bob was a dedicated family man who deeply loved his wife, daughters, grandchildren, sister, and mother. He would often go on trips with his family to Wildwood, NJ, where he had been going since he was a kid. He was a member of the Rifle Club and the Mineral and Fossil Club and was a devout parishioner of Grace Lutheran Church. Bob will be dearly missed by his wife of almost 52 years, Dianne Sherr, his daughters; Susan J. Miller, and husband Todd, and Stephanie Hamilton, and husband Robert, grandchildren; Nicholas Miller, Brent Hamilton, and Christina Hamilton, mother; ClaraMae Sherr, and sister; Joanne Moore. He is preceded in death by his father, Lester Sherr. Funeral Services will be held April 11, 2019 at 11:00am at Grace Lutheran Church located at 517 N. Queen St. Lancaster, PA 17603. Guests will be received for a time of viewing starting at 10:00am. Interment will follow events at the church at Riverview Burial Park. Donations in Bob’s memory can be made to Grace Lutheran Church at the address above. Dear Di,Suzie and Stephanie, there are no words to tell you how my heart breaks for you and your families. I loved him too, he was a wonderful man…. Oh Diane, We are so sorry to hear that Little Bobby Sherr died. We have such fond and happy memories of him. Please know how sad we are that he has died, but what a blessing it was to know him.We are sending our love to you and your family. Memories of growing up on Pine Street ( Bobby Sherr on Frederick) with my brother, ice skating and hockey at Long’s Park and Overlook and–of course–the trains. I send condolences from my brother and me on your loss of a really nice friend and neighbor. Blessings on you all, especially on Bobby. Dear Dianne and family. Sending my sincere sympathy on unexpected death of BOb. Wish I could be there for service but am in VA providing childcare to my grandchildren as my daughter recoups from surgery. Dearest Dianne and family………..you have said goodbye to a loving husband, father and grandfather. Bob lived for his family…..found his greatest happiness in being with them and was always certain to have enough of food to serve everyone!!!! May you find comfort in the prayers of so many people who love you and care about you.